SPRINGFIELD, Mass., (August 4, 2017) – Thompson/Center Arms today announced the launch of its “Hunting Heritage Month” campaign across all of the company’s social media platforms. To celebrate the start of hunting season, Thompson/Center Arms will kick off the month of August with social media content centered on hunting, outdoor recreation, and conservation. Posts will include “how-to” video content, product information, Thompson/Center history, and cooking tips for preparing wild game. To celebrate the launch of “Hunting Heritage Month”, Thompson/Center Arms will launch the “T/C® Compass®Get Out and Shoot Sweepstakes”, which will begin on August 4, 2017 and run until August 31, 2017 at 11:59 PM EST. 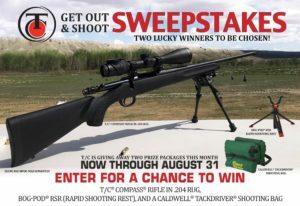 Two winners will be drawn, and each winner will receive a T/C® Compass® Rifle chambered in .204 Ruger, a Bog-Pod® Rapid Shooting Rest, and a Caldwell® Tack Driver® Shooting Bag, a complete packagevalued at over $500 MSRP. To view Thompson/Center Arms’ “Hunting Heritage Month” content on social media, follow Thompson/Center Arms on Facebook, Instagram, and Twitter. 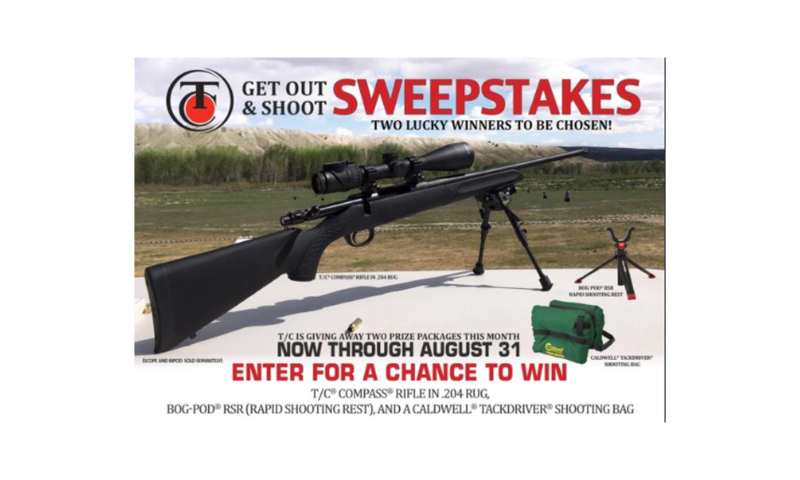 To enter the “T/C® Compass® Get Out and Shoot Sweepstakes”, visit the Thompson/Center Arms Facebook page and follow the sweepstakes entry instructions. To view the Official Rules, please click here.